The Dakota Access Pipeline (DAPL) or Bakken pipeline is a 1,172-mile-long (1,886 km) underground oil pipeline in the United States. 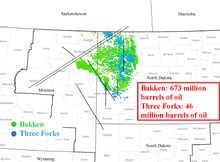 It begins in the shale oil fields of the Bakken formation in northwest North Dakota and continues through South Dakota and Iowa to an oil terminal near Patoka, Illinois. Together with the Energy Transfer Crude Oil Pipeline from Patoka to Nederland, Texas, it forms the Bakken system. The $3.78 billion project was announced to the public in June 2014, and informational hearings for landowners took place between August 2014 and January 2015. Dakota Access, LLC, controlled by Energy Transfer Partners, started constructing the pipeline in June 2016. Phillips 66, and affiliates of Enbridge and Marathon Petroleum have minority interests in the pipeline. The pipeline was completed by April 2017 and its first oil was delivered on May 14, 2017. The pipeline became commercially operational on June 1, 2017. Protests of the Dakota Access Pipeline occurred at several places because of concerns about the pipeline's impact on the environment and to sites sacred to American Indians. Indigenous nations around the country began opposing the pipeline, along with the Sioux tribal nations. In North Dakota, next to and on the Standing Rock Indian Reservation nearly 15,000 people from around the world protested, staging a sit-in for months. The pipeline, which is also referred to as the Bakken pipeline, has a permanent easement of 50 feet (15 m) and a construction right-of-way of up to 150 feet (46 m). The 30-inch (760 mm) diameter pipeline is at least 48 inches (1.2 m) underground from the top of the pipe or 2 feet (0.61 m) below any drain tiles. The pipeline carries 470,000 barrels per day (75,000 m3/d) of crude oil. The capacity may be increased up to 570,000 barrels per day (91,000 m3/d). The pipeline cost $3.78 billion, of which $1.4 billion was invested in the North Dakota portion, $820 million was invested in the South Dakota portion, $1.04 billion was invested in the Iowa portion, and $516 million was invested in the Illinois portion. Of this, $189 million was paid to landowners. The pipeline is estimated to have created 51 permanent jobs across the 4 states. In 2014, Energy Transfer Partners estimated that the pipeline would create between 12 and 15 permanent jobs and from 2,000 to 4,000 temporary jobs in Iowa. The $1.35 billion capital investment in Iowa was projected to generate $33 million sales tax in Iowa during construction and $30 million property tax in 2017. Energy Transfer hired "Strategic Economics Group" in West Des Moines to prepare this analysis. Bakken Oil being shipped by rail in Trempealeau, Wisconsin, a few feet from the Mississippi River. The pipeline provides an outlet for oil to be transferred across the country and then sold to international countries and corporations. The developer argued that the pipeline improves the overall safety to the public, would help the US to attain energy independence, and is a more reliable and safer method of transport to refineries than rail or road. Proponents have argued that the pipeline will free up railroads, which will allow farmers to ship more Midwest grain. About 70% of Bakken oil is transported by rail because of pipeline limitations. As of July 2014[update] Bakken shale oil was transported through nine Iowa counties exclusively via three freight trains per week. As of June 2014, 32 trains per week carrying Bakken oil traveled through Jo Daviess County in northwestern Illinois. Rail offers greater flexibility and adaptability and has had fewer spill volume per Billion-Ton-Miles, but costs significantly more than pipeline transportation and, similar to pipeline, still requires additional investment. 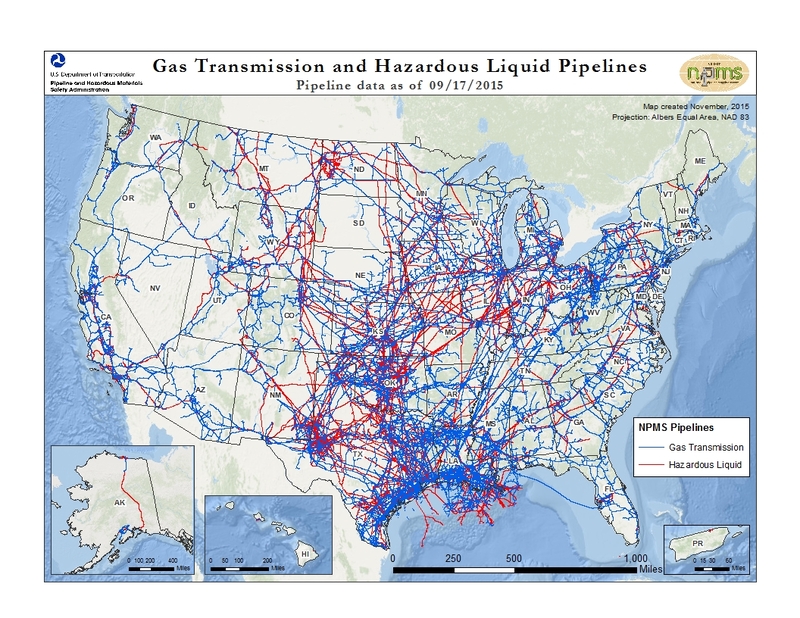 The pipeline is owned by Energy Transfer (36.4% stake), MarEn Bakken Company LLC, and Phillips 66 Partners. MarEn Bakken Company LLC is an entity owned by MPLX LP (an affiliate of Marathon Petroleum) and Enbridge Energy Partners L.P. The pipeline project cost $3.78 billion, of which $2.5 billion was financed by loans, while the rest of the capital was raised by the sale of ownership in Dakota Access, LLC to Enbridge and Marathon Petroleum. The loans were provided by a group of 17 banks, including Citibank, Wells Fargo, BNP Paribas, SunTrust, Royal Bank of Scotland, Bank of Tokyo-Mitsubishi, Mizuho Bank, TD Securities, ABN AMRO Capital, ING Bank, DNB ASA, ICBC, SMBC Nikko Securities and Société Générale. Due to the Dakota Access Pipeline protests, DNB ASA announced in November 2016 to use its position as a lender of over $342 million credit "to encourage a more constructive process to find solutions to the conflict that has arisen." In February 2017, Seattle, Washington's city council unanimously voted to not renew its contract with Wells Fargo "in a move that cites the bank's role as a lender to the Dakota Access Pipeline project as well as its "creation of millions of bogus accounts" and saying the bidding process for its next banking partner will involve "social responsibility." The City Council in Davis, California, took a similar action voting unanimously to find a new bank to handle its accounts by the end of 2017. In March 2017, ING sold its stake in the loan, while retaining a potential risk in case of non-payment under the loan. The pipeline route runs from the northwestern North Dakota Bakken and Three Forks sites. It starts in Stanley, North Dakota, and travels in a southeastward direction to end at the oil tank farm near Patoka, Illinois. It crosses 50 counties in four states. In North Dakota, the 346-mile (557 km) route traverses seven counties. The project consists of 143 miles (230 km) of oil gathering pipelines and 200 miles (322 km) of larger transmission pipeline. The route starts with a terminal in the Stanley area, and runs west with five more terminals in Ramberg Station, Epping, Trenton, Watford City and Johnsons Corner before becoming a transmission line going through Williston, the Watford City area, south of Bismarck, and crossing the Missouri River again north of Cannon Ball. It also includes six tank farm locations, one electric pump station. In the early stages of route planning, it was proposed laying the pipeline 10 miles (16 km) northeast of Bismarck, North Dakota. The Bismarck route was 11 miles (18 km) longer and was rejected by on the basis its potential threat to Bismarck's water supply. It was rejected by the United States Army Corps of Engineers (USACE) in an early environmental assessment before submitting a request to the North Dakota Public Service Commission (NDPSC) for a permit. This decision was described by some activists like Jesse Jackson as environmental racism. The change of the route put the pipeline into the existing pipeline corridor parallel to the already existing Northern Border Pipeline, a natural gas pipeline built in 1982. The Dakota Access pipeline selected a "nearly identical route" and planned to cross the Missouri River near the same point. The plans call for the pipeline to be directionally bored so that it will not come in contact with the Missouri River. It is planned to be "as deep as 90 feet (27.4 m)" below the riverbed. The pipeline does not cross the Sioux land but by a point it is only about 500 feet (150 m) from the Standing Rock reservation. In South Dakota, the pipeline travels 274 miles (441 km) through 12 counties: Campbell, McPherson, Edmunds, Faulk and Spink. The system includes one electric pump station. In Iowa, the pipeline extends about 347 miles (558 km) diagonally through 18 Iowa counties: Lyon, Sioux, O'Brien, Cherokee, Buena Vista Sac, Calhoun, Webster, Boone, Story (which will have a pumping station), Polk, Jasper, Mahaska Keokuk, Wapello, Jefferson, Van Buren, and Lee. The system includes one electric pump station. In Illinois, the 177-mile (285 km) route traverses 12 counties. 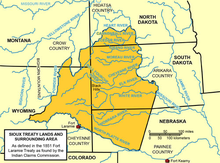 Fort Laramie Treaty boundary which Dave Archambault II invoked, opposing any pipeline construction within that area. Energy Transfer Partners approved and announced the pipeline project on June 25, 2014. In October 2014, Phillips 66 acquired 25% stake in the project. In September 2014, Dakota Access held an initial informational meeting with the Standing Rock Sioux Tribal Council. Informational meetings for South Dakota and Illinois landowners were held in October 2014, and starting on December 1, 2014, in each of the affected counties in Iowa. Meetings in Fort Madison, Sioux Center, Oskaloosa and Storm Lake brought out 200 to 350 people at each venue and in each one some attendees expressed their opposition to the pipeline. A webinar for Brown and Hancock County, Illinois took place in February 2015. On October 29, 2014 Dakota Access submitted the project to the Iowa Utilities Board (IUB), after Iowa Governor Terry Branstad rejected pleas from a coalition of Iowa community and environmental activists who asked him to block plans. In December 2014 Dakota Access submitted an application for a permit from the North Dakota Public Service Commission for the proposed route. In January 2015, Dakota Access filed the application with the IUB. In February 2015, it filed applications with the Iowa Department of Natural Resources for sovereign land and floodplain permits. In April 2015, Iowa Senate Study Bill 1276 and House Study Bill 249 advanced with both Senator Robert Hogg, D-Cedar Rapids, and State Representative Bobby Kaufmann, R-Wilton, in support; it required Dakota Access "to obtain voluntary easements from 75% of property owners along the route before eminent domain could be authorized". On November 12, 2015, the Iowa Utilities Board heard public testimony during one day with more than 275 people signed up opposing the pipeline. In January 2016, Dakota Access filed 23 condemnation suits in North Dakota "against 140 individuals, banks and a coal mine". The IUB approved the pipeline on March 10, 2016, on a vote of 3 to 0, being the last of four states utility regulators granting its approval under the conditions which include liability insurance of at least $25 million; guarantees that the parent companies of Dakota Access will pay for damages created by a pipeline leak or spill; a revised agricultural impact mitigation plan; a timeline for construction notices; modified condemnation easement forms; and a statement accepting the terms and condition's of the board's order." One day later, the company stated it had secured voluntary easements on 82% of the 1,295 affected Iowa land parcels. A week later, Dakota Access filed motions with the IUB requesting expedited and confidential treatment to begin construction immediately, saying it met the conditions and that its liability insurance policies were trade secrets under Iowa law and "would serve no public purpose". In March 2016, the United States Fish and Wildlife Service issued a sovereign lands construction permit. In late May 2016, the permit was temporarily revoked in three counties of Iowa, where the pipeline would cross the Big Sioux River and the Big Sioux Wildlife Management Area; these are historic and cultural sites of the Upper Sioux tribe, including graves in Lyon County. Also in May 2016, Iowa farmers filed lawsuits to prevent the state from using eminent domain to take their land. Citing potential effects on and lack of consultation with the Native American tribes, most notably the Standing Rock Sioux, in March and April 2016 the Environmental Protection Agency, the Department of Interior, and the Advisory Council on Historic Preservation asked the USACE to conduct a formal Environmental Impact Assessment and issue an Environmental Impact Statement. However, in July and August 2016 USACE approved the water crossing permits and issued all but one permission necessary for the pipeline construction. In June 2016, the IUB voted 2 to 1 (Libby Jacobs and Nick Wagner in favor and Chairwoman Geri Huser against) to allow construction on non-sovereign lands to continue. The Sierra Club said this action was illegal before the US Corps of Engineers authorized the project. In late June 2016, construction was allowed to resume in Lyon County after plans were changed to route the pipeline 85 feet (26 m) below the site using directional boring, instead of trenching and disturbing the soil on the surface. In December 2016, the approval was disputed in the Polk County District Court. On July 27, 2016 the Standing Rock Sioux Tribe sued the USACE in the United States District Court for the District of Columbia. On September 9, 2016 U.S. District Judge James Boasberg denied the motion for preliminary injunction. On September 10, 2016 the Standing Rock Sioux Tribe filed an appeal which was denied on October 9, 2016. In August 2016, the joint venture of Enbridge (75%) and Marathon Petroleum (25%) agreed to purchase a 49% stake in Dakota Access, LLC for $2 billion. The deal was completed in February 2017 after the final easement was granted. In September 2016 the U.S Department of Justice received more than 33,000 petitions to review all permits and order a full review of the project's environmental effects. On September 9, 2016, the US Departments of Justice, Army, and Interior issued a joint statement to temporarily halt the project on federal land bordering or under the Lake Oahe reservoir. The US federal government asked the company for a "voluntary pause" on construction near the area until further study was done in the region extending 20 miles (32 km) around Lake Oahe. Energy Transfer Partners rejected the request and resumed construction. On September 13, 2016, chairman and CEO of Energy Transfer Partners Kelcy Warren said concerns about the pipeline's impact on the water supply were "unfounded", that "multiple archaeological studies conducted with state historic preservation offices found no sacred items along the route" and that the company would meet with officials in Washington "to understand their position and reiterate our commitment to bring the Dakota Access Pipeline into operation." On November 1, 2016, President Obama announced his administration was monitoring the situation and had been in contact with the USACE to examine the possibility of rerouting the pipeline to avoid lands that Native Americans hold sacred. On November 14, 2016, the USACE announced that "the Army has determined that additional discussion and analysis are warranted in light of the history of the Great Sioux Nation's dispossessions of lands, the importance of Lake Oahe to the Tribe, our government-to-government relationship, and the statute governing easements through government property." Energy Transfer Partners responded by criticizing the Obama administration for "political interference" and said that "further delay in the consideration of this case would add millions of dollars more each month in costs which cannot be recovered." North Dakota Governor Jack Dalrymple criticized the decision saying the pipeline would be safe and that the decision was "long overdue". Craig Stevens, spokesman for the Midwest Alliance for Infrastructure Now (MAIN) Coalition, called the Corps’s announcement "yet another attempt at death by delay" and said the Obama administration "has chosen to further fan the flames of protest by more inaction." North Dakota Senator John Hoeven said in a statement that the delay "will only prolong the disruption in the region caused by protests and make life difficult for everyone who lives and works in the area." Speaking to CBS News in November, Kelcy Warren said that it would be "100 percent that the easement gets granted and the pipeline gets built" when newly elected President elect Donald Trump came into office on January 20, 2017. On December 4, 2016, the USACE announced, it would not grant an easement for the pipeline to be drilled under Lake Oahe and was undertaking an environmental impact statement to look at possible alternative routes. The Assistant Secretary of the Army (Civil Works), Jo-Ellen Darcy said that "the best way to complete that work responsibly and expeditiously is to explore alternate routes for the pipeline crossing". Energy Transfer Partners and Sunoco Logistics Partners issued a same-day response saying that the White House's directive "is just the latest in a series of overt and transparent political actions by an administration which has abandoned the rule of law in favor of currying favor with a narrow and extreme political constituency." They said that the companies "fully expect to complete construction of the pipeline without any additional rerouting in and around Lake Oahe. Nothing this Administration has done today changes that in any way." On January 18, 2017, the USACE filed its formal Notice of Intent to conduct the Environmental Impact Statement process. The notice opened a thirty-day comment on the scope of the EIS, which concerns the crossing of Lake Oahe. The proposed EIS was to consider "Alternative locations for the pipeline crossing the Missouri River", direct and indirect risks and impacts of an oil spill on the lake, the Standing Rock Sioux's water supply, and their "water, treaty fishing, and hunting rights"; as well as their treaty rights to the lake. The same day U.S. District Judge James Boasberg denied ETP's request to delay the EIS process. On February 7, 2017, the USACE sent a notice of intent to the United States Congress to grant an easement under Lake Oahe 24 hours following notification of the delivery of the notification. On February 9, 2017, the Cheyenne River Sioux sued the easement decision, citing an 1851 treaty and interference with the religious practices of the tribe. On February 22, 2017 the deadline for protesters to leave the camp, the protest site was closed. Although many left voluntarily, ten people were arrested. Even with the arrests, there was no major conflict. Construction of the pipeline was completed by April 2017. The first oil was delivered through the pipeline on May 14, 2017. On June 1, 2017, testing was completed and the pipeline became commercially operational. Near the central Illinois end of the pipeline, debate about the trade-off's between the environment, farm-life and the economy continued after the pipeline began operation. After its first year of operation Forbes reported the pipeline was transporting over 500,000 barrels per day (79,000 m3/d) and had transported approximately 182.5 million barrels (29.02×10^6 m3) of oil. permission to horizontally directionally drill under the Mississippi River navigation channel, under Section 408. Conservation groups worry about safety, and the impacts on air, water, wildlife and farming, because of the risk of the pipeline disruption. Greenpeace and a group of more than 160 scientists dedicated to conservation and preservation of threatened natural resources and endangered species spoke out against the pipeline. The Science & Environmental Health Network also rejected the pipeline. Environmentalists and Native Americans accused the USACE of hastily approving each stage of the review process and ignoring federal regulations and established treaties with Native American tribes. They claimed there was a lack of environmental foresight and consideration. They expressed their fears that the Missouri River might become contaminated in the event of a spill or leak, jeopardizing a source of drinking and irrigation water that millions of people depend on for clean water. They claimed that the environmental review that was performed to analyze the impact of the pipeline on its surroundings was incomplete, claiming that even much smaller, less risky development projects require more rigorous impact analysis than has been completed for the Dakota Access Pipeline. The company responded that the pipeline goes underneath Lake Oahe 90–150 feet (27–46 m) below the surface and it has automated valves on each side of the lake. They also explained that the water outtake for the Standing Rock Sioux Reservation will be 70 miles (110 km) downstream, and that contamination of the water supply is unlikely. It has been reported that the pipeline commercial operations started without oil spill response plan for the Missouri River crossing and without emergency response cleanup equipment stored nearby. Sunoco Logistics, the future operator of the pipeline, has spilled crude oil from its onshore pipelines more often since 2010 than any other US pipeline operator, with at least 203 leaks disclosed to the Pipeline and Hazardous Materials Safety Administration, with a total of 3,406 barrels (143,100 US gal; 541.5 m3) of crude oil spilled. The Iowa Environmental Council stated it is "concerned whether the state has enough protections—from state government oversight to ensuring the company has enough money in reserve to address any harm caused by a spill". Iowa state laws require pipeline owners to have only a $250,000-reserve fund. Iowa Citizens for Community Improvement called the $250,000-reserve fund "fiscally irresponsible" and suggested raising it to at least $1 billion, indexed to inflation, which would match Alaska's precautions of protection. Trenching to install drainage tile in Iowa during the 1980s. Some farmers are concerned about the disturbance of the land, tiling, soil erosion, and soil quality. Iowa fields contain a lot of drain tiles, which can be damaged. The pipeline company said they would repair any tile damaged during construction and place the pipeline 2 feet (.6 m) below drainage tiles. Some farmers were concerned about soil disturbance, but a Dakota Access spokesman noted that the soil had already been disturbed during the installation of drainage tile in all of the contested farms the pipeline planned to cross. During construction there is also concern for the spread of invasive weeds into the surrounding land. Both states (North and South Dakota) list Russian knapweed (Rhaponticum repens), Canada Thistle (Cirsium arvense), Leafy Spurge (Euphorbia esula), Purple Loosestrife (Lythrum salicaria), and Saltceder (Tamarix chinensis) as invasive species of weed. However, under law the management of invasive weeds, once they are on private property, fall under the landowners responsibility. Farmers are also concerned about leaks in the pipeline caused by destabilization in certain areas prone to flooding, which could cause an environmental disaster. Landowners across Iowa have expressed concern about the implications of allowing the state to use eminent domain to condemn privately owned land, particularly agricultural land, on behalf of a company that has not demonstrated any substantial public benefit to the residents of Iowa. In March 2015, a Des Moines Register poll found that while 57% of Iowans supported the Dakota Access Pipeline, 74% were opposed to the use of eminent domain condemnation on behalf of a private corporation. The Iowa chapter of the Sierra Club was "worried about the rights of landowners [...] concerned about [their] Dakota Access LLCs economic projections and whether there are really any benefits to Iowa." For pipelines, eminent domain is most often invoked to grant a legal "right of way" easement for a certain tract of land with a parcel owned by a private landowner(s) as is necessary for the pipeline to pass through the parcels along its route. While many people believe the invocation of "eminent domain" inherently means land is being taken away completely from landowners, landowners do retain ownership of property affected by a pipeline right of way—however, those landowners lose certain rights to the portion of their property encumbered by the easement, including the right to freely use that portion of their property. Because US law requires landowners receive "just compensation" when eminent domain is invoked, landowners whose property rights are affected by the pipeline are compensated for the long-term use of their land, and they are paid for the loss of the current crop on farmland, replacement of fences, and re-seeding of grass. When a landowner voluntarily enters an easement agreement granting a right of way for the pipeline in exchange for compensation, the easement is called a voluntary easement. In August 2016, the company stated that it had already executed easement agreements with 99% of the landowners whose properties lie along the four-state route and, with regards to the landowners along the pipeline's route in Iowa, 99% had entered voluntary easements. The Meskwaki tribe opposes the pipeline for numerous reasons; tribal chairwoman Judith Bender told the Iowa Utilities Board that she is concerned that the pipeline could be used as a replacement if the Keystone XL pipeline is not built. The Standing Rock Sioux and the Cheyenne River Sioux tribes have also stated their opposition to the Dakota Access Pipeline on the grounds that the pipeline and its construction threatens the tribe's "way of life, [their] water, people, and land". In September 2014, Standing Rock Chairman Dave Archambault II indicated the tribe's opposition to any pipeline within treaty boundaries encompassing "North Dakota, Montana, Wyoming and South Dakota." The decision to reroute the pipeline closer to the reservation was described by Jesse Jackson and other critics as "environmental racism". Saying that "the Corps effectively wrote off the tribe's concerns and ignored the pipeline’s impacts to sacred sites and culturally important landscapes," the Standing Rock Sioux Tribe has sued the USACE in the United States District Court for the District of Columbia, accusing the agency of violating the National Historic Preservation Act and other laws, and seeking declaratory and injunctive relief to stop the pipeline. This claim was rejected by the court. U.S. District Judge James E. Boasberg said in the ruling that the USACE "likely complied" with its obligation to consult the tribe and that the tribe "has not shown it will suffer injury that would be prevented by any injunction the Court could issue." On September 20, 2016, Dave Archambault II addressed the UN Human Rights Council in Geneva, Switzerland, where he called "upon all parties to stop the construction of the Dakota Access Pipeline." Citing the 1851 Treaty of Traverse des Sioux and 1868 Treaty of Fort Laramie, two treaties ratified by the U.S. Senate that recognize the Sioux's national sovereignty, Archambault told the Council that "the oil companies and the government of the United States have failed to respect our sovereign rights." On September 22, 2016, Victoria Tauli-Corpuz, a United Nations expert on the rights of indigenous peoples, admonished the U.S., saying, "The tribe was denied access to information and excluded from consultations at the planning stage of the project, and environmental assessments failed to disclose the presence and proximity of the Standing Rock Sioux Reservation." She also responded to the rights of pipeline protesters, saying, "The U.S. authorities should fully protect and facilitate the right to freedom of peaceful assembly of indigenous peoples, which plays a key role in empowering their ability to claim other rights." According to the statement by Alvaro Pop Ac, Chair of the United Nations Permanent Forum on Indigenous Issues, "the project was proposed and planned without any consultation with the Standing Rock Sioux or others that will be affected by this major project." According to the USACE's data there had been 389 meetings with more than 55 tribes, including nine meetings with The Standing Rock Sioux Tribe. Kelcy Warren has stated that the company is not on any Native American property. In December 2016, Trump's Native American Coalition held a meeting where members, American Indian and Alaska Native Tribal leaders, and activists could be present to discuss a wide variety of topics that concerned the effects and implications of the pipeline construction as well as environmental protections and safety concerns. The general purpose of this meeting was to provide facts in place of rumors so that every involved party could be properly informed. Several groups, including the Standing Rock Sioux and the Society for American Archaeology, have raised concerns over the thoroughness of archaeological surveys conducted along the pipeline’s corridor. These surveys were carried out under the direction of the USACE, in compliance with the National Historic Preservation Act (NHPA). The NHPA requires consideration of archaeological sites and traditional cultural properties. The initial survey showed 149 sites and the pipeline was subsequently moved to avoid 140 of them. The Advisory Council on Historic Preservation, which oversees compliance with the NHPA, raised two primary concerns to the USACE about the surveys. They criticized the scope of the investigation, which defined each water crossing as a separate project, and therefore failed to consider the pipeline as a whole. They also criticized the lack of tribal involvement in the surveys. Tribal consultants help archaeologists identify sites that may be harder to see within the archaeological record, such as traditional cultural properties. A traditional cultural property is a property whose "significance derived from the role the property plays in a community’s historically rooted beliefs, customs, and practices." The USACE reached out to the Standing Rock Sioux on several occasions for consultation, but were denied. The Sioux refused to participate unless they could consult on the whole pipeline. One instance of tribal consultation at Lake Oahe identified several cultural sites and a cemetery that the USACE previously failed to note. On September 2, 2016 Tim Mentz, a former Historic Preservation Officer for the Standing Rock Sioux, testified in DC District Court that 27 graves and 82 sacred sites were to be disturbed by the Cannonball river section of the pipeline. That weekend this area was bulldozed. On September 21, 2016, 1,281 anthropologists, archaeologists, museum officials, and others signed and released a letter in support of the tribal community, calling for further study of the area to be affected by the pipeline in South Dakota. The Society for American Archaeologists also sent a letter to the USACE, detailing their organizations concerns over the project. According to the North Dakota State Historic Preservation Office, the areas highlighted by Tim Mentz were evaluated by state officials on both September 21 and October 20, 2016. They found that only four stone features would be directly impacted by the pipeline. However, many are still concerned about the cumulative effect the project may have on sites that lie outside the 150 ft corridor. Jon Eagle, a Historic Preservation Officer for the tribe, was invited to participate in the evaluation on Sept. 23, but was not allowed access to the areas of the corridor on private property. The tribe insists that evidence was destroyed by the construction company, as grading had gone on in the area previously. According to his federal disclosure forms, filed in May 2016, President Donald Trump held between $15,000 and $50,000 in stock in Energy Transfer Partners – down from $500,000 to $1 million in 2015 – and between $100,000 and $250,000 in Phillips 66. This creates a conflict of interest when making presidential decisions affecting the pipeline project. The senior Democrat on the Public Resources Committee, Raul Grijalva, called this appearance of conflict of interest "disturbing". The Washington Post reported that Trump sold off his shares in Energy Transfer Partners in the summer of 2016. Trump is also indirectly linked to the project because Energy Transfer Partners CEO Kelcy Warren contributed $103,000 to the Trump campaign. Trump has said that he supports the completion of the pipeline project. According to his transition team this position "has nothing to do with his personal investments and everything to do with promoting policies that benefit all Americans." A former staffer of Iowa Governor Terry Branstad re-election campaign, Susan Fenton, who is now the director of government affairs with the Des Moines public relations firm LS2, is handling public relations for Energy Transfer. Texas governor Rick Perry was member of the Energy Transfer Partners and Sunoco Logistics Partners boards of directors but resigned after Trump selected Perry as his nomination for Energy Secretary In December 2016. Kelcy Warren had contributed $6 million to Perry's 2016 Presidential campaign. Many Sioux tribes have said that the pipeline threatens the Tribe’s environmental and economic well-being, and that it has damaged and destroyed sites of great historic, religious, and cultural significance. The tribe has expressed concern over leaks because the pipeline passes under Lake Oahe, which serves as a major source of water. Protests at pipeline construction sites in North Dakota began in the spring of 2016 and drew indigenous people, calling themselves water protectors and land defenders, from throughout North America as well as many other supporters, creating the largest gathering of Native Americans in the past hundred years. In April 2016, a Standing Rock Sioux elder established a camp near the Missouri River at the site of Sacred Stone Camp, located within the Standing Rock Indian Reservation, as a center for cultural preservation and spiritual resistance to the pipeline, and over the summer the camp grew to thousands of people. In July, ReZpect Our Water, a group of Native American youth, ran from Standing Rock in North Dakota to Washington, DC to raise awareness of what they perceive as a threat to their people's drinking water and that of everyone who relies on the Missouri and Mississippi rivers for drinking water and irrigation. While the protests drew international attention and were said to be "reshaping the national conversation for any environmental project that would cross the Native American land", there was limited mainstream media coverage of the events in the United States until early September. At that time, construction workers bulldozed a section of land that tribal historic preservation officers had documented as a historic, sacred site, and when protesters entered the area security workers used attack dogs, which bit at least five of the protesters. The incident was filmed and viewed by several million people on YouTube and other social media. In late October, armed soldiers and police with riot gear and military equipment cleared an encampment that was directly in the proposed pipeline's path. According to state and federal authorities, there were several cases of arson that damaged pipeline construction equipment in Iowa during 2016. One deliberately set fire caused nearly $1 million in damage to construction equipment in August in Jasper County, Iowa. Two other fires involving pipeline construction equipment were set around the same time in the same county and another was set in Mahaska County. In October, another arson fire caused $2 million worth of damage to pipeline construction equipment in Jasper County, Iowa. On November 15, protesters in Chicago, Los Angeles, Manhattan, Denver, and other cities held protests against the pipeline in a coordinated protest which organizers called a "National Day of Action". In January 2017, President Donald Trump issued a memorandum directing the USACE to expedite the project. After the USACE approved the final easement under Lake Oahe on February 9, allowing Dakota Access to complete the pipeline, the decision was challenged in a lawsuit by the Cheyenne River Sioux. Sacred Stone Camp was cleared by local law enforcement on February 22, 2017. In December 2016, it was reported that Dakota Access LLC had hired the firm TigerSwan to provide security during the protest. In May 2017, internal TigerSwan documents leaked to The Intercept and other documents obtained through public records requests revealed a close collaboration between the pipeline company and local, state, and federal law enforcement as they carried out "military-style counterterrorism measures" to suppress the protesters. TigerSwan also collected information used to assist prosecutors in building cases against protesters, and used social media in an attempt to sway public support for the pipeline. One of the released documents called the pipeline opposition movement "an ideologically driven insurgency with a strong religious component" that operated along a "jihadist insurgency model". ^ "Bakken Pipeline Map". bakkenpipelinemap.com. n.d. Retrieved December 14, 2016. ^ Petroski, William (March 16, 2015). "Meskwaki tribe opposes Bakken oil pipeline through Iowa". USA Today. Retrieved April 8, 2015. ^ a b c Renshaw, Jarrett (2017-04-19). "East Coast refiner shuns Bakken delivery as Dakota Access Pipeline starts". Reuters. Retrieved 2017-05-11. ^ a b Cama, Timothy (June 1, 2017). "Dakota Access pipeline now in service". The Hill. Retrieved June 1, 2017. ^ a b "Dakota Access pipeline starts transporting oil to customers". New York Daily News. The Associated Press. June 1, 2017. Retrieved June 10, 2017. ^ a b c Petroski, William (August 25, 2014). "Should farmers make way for the Bakken pipeline?". Iowa City Press-Citizen. ^ Healy, Jack (August 26, 2016). "North Dakota Oil Pipeline Battle: Who's Fighting and Why". The New York Times. (Subscription required (help)). ^ DALRYMPLE, AMY (October 19, 2018). "Dakota Access expansion takes step forward". The Bismarck Tribune. ^ a b c d e f "Dakota Access Pipeline Facts". 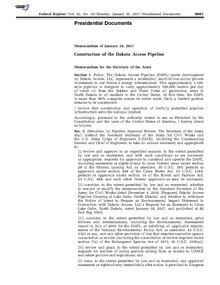 Dakota Access, LLC. ^ JUHASZ, ANTONIA (September 12, 2018). "DEATH ON THE DAKOTA ACCESS". Pacific Standard. ^ a b Keenan, Chelsea (October 1, 2014). "Texas energy company releases more details on pipeline". The Gazette. ^ Eller, Donnelle (November 12, 2014). "Pipeline could bring $1.1 billion to Iowa". Des Moines Register. ^ a b c Eller, Donnelle (December 4, 2014). "Unlikely allies join to fight pipeline project". Iowa City Press-Citizen. ^ a b Petroski, William (February 9, 2016). "296 Iowa landowners decline Bakken pipeline". Des Moines Register. Retrieved 2016-11-06. ^ a b "Illinois oil train derailment involved safer tank cars". gmtoday.com. Associated Press. March 6, 2015. Retrieved December 4, 2016. As of June of last year, BNSF was hauling 32 Bakken oil trains per week through the surrounding Jo Daviess County, according to information disclosed to Illinois emergency officials. ... According to the Association of American Railroads, oil shipments by rail jumped from 9,500 carloads in 2008 to 500,000 in 2014, driven by a boom in the Bakken oil patch of North Dakota and Montana, where pipeline limitations force 70 percent of the crude to move by rail. ^ Petroski, William (July 7, 2014). "Bakken oil trains run through Iowa". The Des Moines Register. Retrieved December 4, 2016. ^ John Frittelli; Anthony Andrews; Paul W. Parfomak; Robert Pirog; Jonathan L. Ramseur; Michael Ratner (April 26, 2014). U.S. Rail Transportation of Crude Oil: Background and Issues for Congress (PDF) (Report). Congressional Research Service. Archived from the original (PDF) on 2014-03-28. Retrieved December 4, 2016. ^ a b "Energy Transfer: BAKKEN". Energy Transfer. ^ a b c Aronsen, Gavin (October 28, 2014). "Energy Transfer, Phillips 66 partner on Iowa pipeline". Ames Tribune. ^ MacMillan, Hugh (May 12, 2017). ""Who's Banking on DAPL" Dakota Access Pipeline Finance Update". Last Real Indians. ^ "Who's Investing in the Dakota Access Pipeline? Meet the Banks Financing Attacks on Protesters". Democracy Now!. September 6, 2016. ^ "Norway's biggest bank may reconsider Dakota Access funding". CBC News. November 8, 2016. ^ Geiger, Julianne (November 7, 2016). "Another Setback For DAPL As Norwegian Bank Rethinks Funding". oilprice.com. Retrieved November 8, 2016. ^ "ING has sold its stake in Dakota Access pipeline loan" (Press release). ING Bank. March 21, 2017. Retrieved June 10, 2017. ^ Wong, Julia Carrie (March 21, 2017). "Dakota Access pipeline: ING sells stake in major victory for divestment push". The Guardian. Retrieved June 10, 2017. ^ Tchekmedyian, Alene; Etehad, Melissa (2016-11-01). "2 years of opposition, 1,172 miles of pipe, 1.3 million Facebook check-ins. The numbers to know about the Standing Rock protests". Los Angeles Times. Retrieved 2016-12-03. ^ Nowatzki, Mike (August 30, 2014). "'Stealth' North Dakota Bakken oil pipeline project faces fight". Pioneer Press. Retrieved December 4, 2014. ^ Aisch, Gregor; Lai, K.K. Rebecca (2016-11-01). "The Conflicts Along 1,172 Miles of the Dakota Access Pipeline". The New York Times. Retrieved 2017-03-17. ^ a b Dalrymple, Amy (August 18, 2016). "Pipeline route plan first called for crossing north of Bismarck". The Bismarck Tribune. Archived from the original on November 1, 2016. Retrieved March 17, 2017. ^ a b c Thorbecke, Catherine (2016-11-03). "Why a Previously Proposed Route for the Dakota Access Pipeline Was Rejected". ABC News. Retrieved 2017-03-17. ^ a b MacPherson, James (November 3, 2016). "If Dakota Access pipeline were to move, where?". Associated Press. Retrieved November 27, 2016. ^ a b Freeman, Makia (2016-01-04). "Standing Rock 2017 and the Dakota Access Pipeline (DAPL): The Fight is Not Over". The Freedom Articles. Retrieved 2017-01-08 – via Centre for Research on Globalization. ^ Evans, Bo (August 18, 2016). "ND PSC says Dakota Access Pipeline will not come into physical contact with Missouri River". KFYR TV. Retrieved November 27, 2016. ^ Dakota Access Pipeline. Environmental assessment: Dakota Access Pipeline Project, crossings of flowage easements and federal lands (Report). U.S. Army Corps of Engineers, Omaha District. p. 385. Retrieved November 27, 2016. ^ Connie Sieh Groop (September 15, 2014). 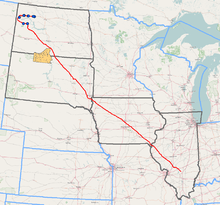 "Bakken pipeline would cross northeastern South Dakota to get to Illinois". Aberdeen News. Schurz Communications. Retrieved December 4, 2014. ^ Sept 30th DAPL meeting with SRST. Standing Rock Sioux Tribe. September 30, 2014. Event occurs at 5:48. Retrieved November 27, 2016 – via Youtube. (evocation of treaty boundaries: Fort Laramie Treaties (1851 and 1868) and standing resolution from 2012). Afterward, Chuck Frey (VP of ETP) makes a presentation of the DAPL project. ^ "Energy Transfer (ETP) Reveals Bakken Pipeline Open Season" (Press release). Energy Transfer Partners. 2014-06-25. Retrieved 2016-12-12 – via Business Wire. ^ Boshart, Rod (December 1, 2014). "Iowa oil pipeline meetings start today". The Gazette. ^ Joyce Russell (December 2, 2014). "Landowners Question Bakken Pipeline". Iowa Public Radio. NPR.org. Retrieved December 3, 2014. ^ "Concerns voiced at oil pipeline meeting in S.E. Iowa". Associated Press. December 1, 2014. ^ a b Krause, Rachael (December 1, 2014). "Hundreds Pack Inside Sioux Center Meeting On Proposed Dakota Access Pipeline Project". SiouxLandMatters.com. Nexstar Broadcasting, Inc. Retrieved December 4, 2014. ^ Mark Tauscheck (December 3, 2014). "Iowans pack meeting on new oil pipeline". KCCI-TV. Des Moines Hearst Television Inc. Retrieved December 4, 2014. ^ "Two county Farm Bureaus to host crude oil pipeline webinar". Illinois Farm Bureau. February 6, 2015. Retrieved March 3, 2015. ^ Iowa Utilities Board (n.d.). "Docket Summary for Docket HLP-2014-0001". Retrieved December 1, 2014. ^ Petroski, William (October 14, 2014). "Branstad won't stop Bakken oil pipeline through Iowa". Des Moines Register. Retrieved December 1, 2014. ^ Dakota Access, LLC (December 2014). "North Dakota Public Service Commission Combined Application for Certificate of Corridor Compatibility and Route Permit" (PDF). ^ Petroski, William (January 20, 2015). "Bakken pipeline OK requested; setting up Iowa showdown". Des Moines Register. Retrieved February 10, 2015. ^ Lloyd, John (2015-02-07). "Proposed Bakken pipeline construction requires at least two DNR permits". Boone News–Republican. Retrieved 2016-12-14. ^ Petroski, William (April 28, 2015). "Iowa bills place hurdles for Bakken pipeline, powerline". Des Moines Regicter. Retrieved May 1, 2015. ^ Meyer, Amy (2015-11-12). "Public Voices Support And Oppose Bakken Pipeline Across Iowa". Iowa Public Radio. Retrieved 2016-12-14. ^ Donovan, Lauren (January 1, 2016). "Dakota Access pipeline files condemnation lawsuits". Bismarck Tribune. Retrieved July 23, 2016. ^ Petrowski, William (May 27, 2016). "Tribal land issues block Bakken pipeline in Iowa". Des Moines Register. Retrieved June 8, 2016. ^ Petroski, William (May 20, 2016). "Iowa farmers sue to block use of eminent domain for Bakken pipeline". Des Moines Register. Retrieved July 23, 2016. ^ a b "Frequently Asked Questions DAPL". US Army Corps of Engineers. Retrieved 2017-01-12. ^ William Petrowski (June 6, 2016). "Despite critics, Bakken pipeline gets go-ahead in Iowa". Des Moines Register. Retrieved June 8, 2016. ^ Petroski, William (June 20, 2016). "Bakken pipeline will run under sacred tribal site". Des Moines Register. Retrieved November 26, 2016. ^ Petroski, William (2016-12-15). "Dakota Access pipeline approval disputed in Iowa court". Des Moines Register. Retrieved 2017-01-08. ^ "Standing Rock Sioux Tribe v. U.S. Army Corps of Engineers. Complaint for Declaratory and Injunctive Relief" (PDF). In the United States District Court for the District of Columbia (1:16-cv-01534-Document 1). July 27, 2016. Retrieved August 6, 2016. ^ "Standing Rock Sioux Tribe v. U.S. Army Corps of Engineers. Memorandum in Support of Motion for Preliminary Injunction Expedited Hearing Requested" (PDF) (1:16-cv-1534-JEB). United States District Court for the District of Columbia. August 4, 2016. Archived from the original (PDF) on August 7, 2016. Retrieved August 6, 2016. ^ Delfeus, Sophie (2016-12-19). "The suspended battle at Standing Rock". Intercontinental Cry. Retrieved 2017-01-08. ^ Cryderman, Kelly (2016-08-02). "Enbridge, Marathon Petroleum buy Bakken pipeline stake for $2-billion". The Globe and Mail. Retrieved 2016-11-06. ^ Penty, Rebecca (2016-08-03). "Enbridge, Marathon Agree to Buy $2 Billion Bakken Pipe Stake". Bloomberg. Retrieved 2016-11-06. ^ Johnson, Brooks (2017-02-15). "Enbridge closes on Dakota Access stake". Duluth News Tribune. Retrieved 2017-04-29. ^ Michael Leland, Iowa Public Radio (15 September 2016). "Bakken pipeline opposition presents petitions to U.S. Justice Department". Radio Iowa. Retrieved 25 September 2016. ^ "Joint Statement from the Department of Justice, the Department of the Army and the Department of the Interior Regarding Standing Rock Sioux Tribe v. U.S. Army Corps of Engineers". Office of Public Affairs, United States Department of Justice. 9 September 2016. Retrieved 17 September 2016. ^ Gaudiano, Nicole (September 13, 2016). "Bernie Sanders, Native Americans say oil pipeline will poison drinking water". USA Today. ^ Hersher, Rebecca. "Obama: Army Corps Examining Possible Rerouting Of Dakota Access Pipeline". National Public Radio. Retrieved December 1, 2016. ^ "Corps: More discussion needed before agency will approve Dakota Access easement". The Bemidji Pioneer. ^ MacPherson, James; Nicholson, Blake (November 15, 2016). "Pipeline Company Seeks Court Permission to Proceed With Plan". ABC news. Retrieved November 18, 2016. ^ "Corps: More discussion needed before agency will approve Dakota Access easement". The Bemidji Pioneer. Bemidji Pioneer and Forum Communications Company. November 14, 2016. Retrieved November 18, 2016. ^ "A Violation of Tribal & Human Rights: Standing Rock Chair Slams Approval of Dakota Access Pipeline". Democracy Now. February 8, 2017. ^ "Standing Rock Sioux Tribe's Statement on U.S. Army Corps of Engineers Decision to Not Grant Easement". Stand With Standing Rock. 2016-12-04. Retrieved 2016-12-04. ^ "Dakota Access Pipeline to be rerouted". CNN. 2016-12-04. Retrieved 2016-12-04. ^ Healy, Jack; Fandos, Nicholas (5 December 2016). "Protesters Gain Victory in Fight Over Dakota Access Oil Pipeline". The New York Times. p. A1. Retrieved 5 December 2016. ^ "Army will not grant easement for Dakota Access Pipeline crossing" (Press release). U.S. Army ASA (CW). December 4, 2016. Archived from the original on December 4, 2016. Retrieved December 5, 2016. ^ "Energy Transfer Partners and Sunoco Logistics Partners Respond to the Statement from the Department of the Army" (Press release). Energy Transfer Partners. 2016-12-04. Retrieved December 14, 2016 – via Business Wire. ^ a b "Notice of Intent To Prepare an Environmental Impact Statement in Connection With Dakota Access, LLC's Request for an Easement To Cross Lake Oahe, North Dakota". Federal Register. 2017-01-18. Retrieved 2017-01-24. ^ "Federal Study on Dakota Access Pipeline to Move Forward". ABC News. Retrieved 2017-01-24. ^ Jones, Athena; Diamond, Jeremy; Krieg, Gregory (2017-01-24). "Trump advances controversial oil pipelines with executive action". CNN. Retrieved 2017-04-29. ^ Mufson, Steven (January 24, 2017). "Trump seeks to revive Dakota Access, Keystone XL oil pipelines". Washington Post. Washington, DC. Retrieved January 24, 2017. ^ Jacobs, Jennifer; Dlouhy, Jennifer A.; Vamburkar, Meenal (January 24, 2017). "Trump Pins Keystone and Dakota Pipeline Fate on Renegotiation". Bloomberg. Retrieved January 24, 2017. ^ a b "Executive Order Expediting Environmental Reviews and Approvals For High Priority Infrastructure Projects". whitehouse.gov (Press release). 2017-01-24. Retrieved 2017-04-29. ^ Meyer, Robinson (2017-01-24). "Trump's Dakota Access Pipeline Memo: What We Know Right Now". The Atlantic. Retrieved 2017-04-29. ^ Hersher, Rebecca (2017-02-07). "Army Approves Dakota Access Pipeline Route, Paving Way For The Project's Completion". NPR. Retrieved 8 February 2017. ^ "Dakota Access Pipeline Notification Grijalva". Retrieved February 8, 2017. ^ Winsor, Morgan; Hill, James (9 February 2017). "Cheyenne River Sioux Tribe Files 1st Legal Challenge Over Dakota Access Pipeline Easement". ABC News. Retrieved 10 February 2017. ^ Chappell, Bill (9 February 2017). "Tribe Reportedly Files Legal Challenge To Dakota Access Pipeline". NPR. Retrieved 24 February 2017. ^ Cuevas, Mayra; Sidner, Sara; Simon, Darran (2017-02-24). "Dakota Access Pipeline protest site is cleared". CNN. Retrieved 2017-03-01. ^ O'Connell, Patrick M. (January 4, 2018). "Dakota Access pipeline a mix of angst, potential for those near central Illinois tank farm". Chicago Tribune. Retrieved 2018-01-04. ^ McCown, Brigham A. (June 4, 2018). "What Ever Happened To The Dakota Access Pipeline?". Forbes. Retrieved June 7, 2018. ^ "Live updates from Dakota Access Pipeline protests: 'It will be a battle here'". The Seattle Times. October 26, 2016. Retrieved October 26, 2016. ^ "Frequently Asked Questions DAPL". US Army Corps of Engineers. Retrieved 2017-01-12. ^ Sherman, Erik (June 14, 2017). "Court Sends Dakota Pipeline Back To The Environmental Drawing Board". Forbes. Retrieved July 19, 2017. ^ Petroski, William (July 10, 2014). "Oil pipeline across Iowa proposed". Des Moines Register. Gannett Company. Archived from the original on December 4, 2014. Retrieved December 4, 2014. ^ a b Dawson, Chester; Maher, Kris (October 12, 2016). "Fight Over Dakota Access Pipeline Intensifies; Company behind the project expects final approval; opponents vow to continue effort". The Wall Street Journal. Retrieved November 15, 2016. ^ Januchowski-Hartley, Stephanie; Hilborn, Anne; Crocker, Katherine C.; Murphy, Asia. "Scientists stand with Standing Rock". Science (6307). p. 1506. Retrieved November 19, 2016. ^ Januchowski-Hartley, Stephanie (September 2016). "DAPL Scientist Sign-On Letter" (PDF). srjanuchowski-hartley.com. self-published. Retrieved November 14, 2016. ^ Raffensperger, Carolyn (December 5, 2014). "A Legal and Political Analysis of the Proposed Bakken Oil Pipeline in Iowa". SEHN. Retrieved February 2, 2015. ^ Yan, Holly (October 28, 2016). "Dakota Access Pipeline: What's at stake?". CNN. Retrieved November 15, 2016. ^ a b "Standing Rock Sioux take action to protect culture and environment from massive crude oil pipeline". Earth Justice. August 1, 2016. Retrieved November 15, 2016. ^ "CEO behind Dakota Access to protesters: 'We're building the pipeline'". PBS Newshour. November 16, 2016. Retrieved November 22, 2016. ^ Mc Kenna, Phil (June 1, 2017). "Dakota Access Pipeline Will Start Operating Without a Proper Oil Spill Response Plan". Slate. Retrieved June 10, 2017. ^ "Sunoco, behind protested Dakota pipeline, tops U.S. crude spill charts". Reuters. 2016-09-23. Retrieved 2016-11-02. ^ Malachowski, Nathan (January 17, 2015). "Branstad bullying Legislature over pipeline". Des Moines Register. Retrieved February 10, 2015. ^ Hardy, Kevin (August 24, 2016). "Dakota Access pipeline wrecking soil, farmers complain". Des Moines Register. ^ "Dakota Access Pipeline Project U.S. Fish And Wildlife Service Environmental Assessment Grassland And Wetland Easement Crossing" (PDF). December 2015. Retrieved February 24, 2015. ^ Lloyd, Jon (November 15, 2014). "Pipeline meeting to take place next month in Boone". Boone News Republican. Stephens Media LLC. Archived from the original on 2015-01-12. Retrieved December 4, 2014. ^ "Iowa Poll: Iowans back energy projects, but oppose eminent domain". www.desmoinesregister.com. 2 March 2015. Retrieved 2 March 2015. ^ Fragoso, Alejandro Dávila (June 7, 2016). "For-Profit Pipelines Are Growing And So Are Eminent Domain Battles". Retrieved December 14, 2016. ^ "Invoking power of eminent domain, gas industry runs roughshod over private property". Retrieved December 14, 2016. ^ Sample of an actual right-of-way agreement; Pipeline Safety Trust. ^ "Landowner's Guide to Pipelines - Pipeline Safety Trust". Retrieved December 14, 2016. ^ "August 2016: Iowa Progress Report" (PDF). Dakota Access, LLC. August 9, 2016. Archived from the original (PDF) on 2016-10-28. Retrieved November 15, 2016. ^ "This Is The #NoDAPL Last Stand". Sacred Stone Camp - Iŋyaŋ Wakháŋagapi Othí. Retrieved 2017-03-03. ^ Archambault II, Dave (August 15, 2016). "Call to Action of Indigenous People's". Standing Rock Sioux Tribe. Retrieved November 15, 2016 – via Stand with Standing Rock. ^ Thorbecke, Catherine (4 November 2016). "Why Previously Proposed Route for Dakota Access Pipeline Was Rejected". ABC News. Retrieved 6 November 2016. ^ Monet, Jenni (September 10, 2016). "Standing Rock Sioux tribe claims small victory in pipeline battle". pbs.org. Retrieved September 17, 2016. ^ Amundson, Barry (July 29, 2016). "Standing Rock tribe sues over Dakota Access pipeline permits". Grand Forks Herald. Retrieved August 6, 2016. ^ Kennedy, Merrit (2016-09-09). "Judge Rules That Construction Can Proceed On Dakota Access Pipeline". NPR. Retrieved 2017-01-08. ^ Kerpen, Phil (2016-09-02). "UN Joins Green Group Activists in Anti-Energy Protest to Block N. Dakota Pipeline". CNSNews.com. Retrieved 2016-12-03. ^ Medina, Daniel A. (2016-09-13). "Sioux's Concerns Over Pipeline Impact on Water Supply 'Unfounded,' Company Says". NBC News. Retrieved 2016-12-03. ^ Restuccia, Andrew; Palmer, Anna (2016-12-16). "Trump team reaches out to Native Americans". Politico. Retrieved 2017-04-29. ^ a b c d "DAPL is the biggest issue in Public Archaeology right now". Master of Arts in Public Archaeology at Binghamton University. 2016-09-09. Retrieved 2017-05-09. ^ a b Jeff, Joeckel (2001-11-28). "Introduction: Guidelines for Evaluating and Documenting Traditional Cultural Properties". National Register of Historic Places Bulletin. Retrieved 2017-05-09. ^ "National Historic Preservation Act, 1966 as Amended (2000)". Federal Emergency Management Agency. Retrieved 2017-05-09. ^ a b c d e f g h i j k Colwell, Chip. "How the archaeological review behind the Dakota Access Pipeline went wrong". The Conversation. Retrieved 2017-05-09. ^ "Pipeline Will Proceed Despite Tribal Protests". Courthouse News Service. 2016-09-09. Retrieved 2017-05-09. ^ a b c d Nelson, Reid J. (2016-05-19). "Ex-32-ACHP-Objection-Letter-DAPL". www.documentcloud.org. Retrieved 2017-05-09. ^ a b c "Grave Matters in Pipeline Controversy". WhoWhatWhy. 2016-09-19. Retrieved 2017-05-09. ^ a b "Did the Dakota Access Pipeline Company Deliberately Destroy Sacred Sioux Burial Sites?". Democracy Now!. 2016-09-06. Retrieved 2017-05-09. ^ a b c "State-Commissioned Archaeological Study Denies Standing Rock Experts a Voice". Indian Country Today. 2016-10-06. Retrieved 2017-05-09. ^ a b Ryzik, Melena (2016-09-21). "Museum Officials and Archaeologists Sign Petition Against N. Dakota Pipeline". The New York Times. ISSN 0362-4331. Retrieved 2017-05-09. ^ Gifford-Gonzalez, Diane (2016-09-13). "DAPL Letter" (PDF). Society for American Archaeology. Retrieved 2017-05-09. ^ "Trump's stock in Dakota Access pipeline raises concerns". Al Jazeera. 2016-11-25. Retrieved 2016-11-26. ^ Mufson, Steven (23 November 2016). "Trump dumped his stock in Dakota Access pipeline owner over the summer". The Washington Post. Retrieved 2016-11-26. ^ Hampton, Liz; Volcovici, Valerie (2016-11-25). "Top executive behind Dakota Access has donated more than $100,000 to Trump". Reuters. Retrieved 2016-11-26. ^ Milman, Oliver (October 26, 2016). "Dakota Access pipeline company and Donald Trump have close financial ties". The Guardian. Retrieved November 2, 2016. ^ Volcovici, Valerie (2016-12-01). "Trump supports completion of Dakota Access Pipeline". Reuters. Retrieved 2016-12-03. ^ Aronsen, Gavin (October 28, 2014). "Energy Transfer, Phillips 66 partner on Iowa pipeline". Ames Tribune. ^ Keitz, Anders (2017-01-06). "Rick Perry Resigns From Boards of Dakota Access Pipeline Companies". The Street. Retrieved 2017-01-10. ^ "Million-Dollar Donors in the 2016 Presidential Race". The New York Times. 2016-02-09. Retrieved 2016-09-10. ^ "People at the front lines of the battle over the Dakota Access Pipeline are calling it a 'death sentence'". Business Insider. Retrieved 2017-03-03. ^ "#NoDAPL: Land Defenders Disrupt Gubernatorial Debate, Shut Down 5 Construction Sites". Democracy Now!. October 4, 2016. ^ "Life in the Native American oil protest camps". BBC News. 2 September 2016. ^ Bravebull Allard, LaDonna (September 3, 2016). "Why the Founder of Standing Rock Sioux Camp Can't Forget the Whitestone Massacre". Yes! Magazine. Retrieved October 25, 2016. ^ Liu, Louise (September 13, 2016). "Thousands of protesters are gathering in North Dakota — and it could lead to 'nationwide reform'". Business Insider. Retrieved September 20, 2016. ^ Gray, Jim (September 8, 2016). "Standing Rock: The Biggest Story That No One's Covering". Indian Country Today Media Network. Retrieved October 25, 2016. ^ "VIDEO: Dakota Access Pipeline Company Attacks Native American Protesters with Dogs and Pepper Spray". Democracy Now!. Retrieved 2016-11-06. ^ Staff, ICTMN (September 4, 2016). "What Dakota Access Destroyed: Standing Rock Former Historic Preservation Officer Explains What Was Lost [Video]". Indian Country Today Media Network. Retrieved October 25, 2016. ^ Manning, Sarah Sunshine (September 4, 2016). "'And Then the Dogs Came': Dakota Access Gets Violent, Destroys Graves, Sacred Sites". Indian Country Today Media Network.com. Retrieved September 6, 2016. ^ Silva, Daniella (October 27, 2016). "Dakota Access Pipeline: More Than 100 Arrested as Protesters Ousted From Camp". NBC News. Retrieved October 28, 2016. ^ Petroski, William (August 1, 2016). "Nearly $1 million in arson reported on Bakken pipeline project". Des Moines Register. ^ Aguirre, Joey (October 17, 2016). "Dakota Access offers $100,000 for information leading to arson conviction". Des Moines Register. ^ Daniel A. Medina; Chiara Sottile (November 16, 2016). "Scores Arrested in Dakota Access Pipeline Protests Nationwide". NBC news. Retrieved November 22, 2016. ^ "Recent News". Sacred Stone Camp - Iŋyaŋ Wakháŋagapi Othí. Retrieved 2017-03-03. ^ "Clashes break out at Standing Rock as Trump pushes DAPL ahead". Mother Jones. Retrieved 2017-04-29. ^ May, Charlie. "A reporter's notebook:The journey to Oceti Sakowin, the protest camp of the Standing Rock Sioux". salon. Retrieved 15 May 2017. ^ Brown, Alleen. "Leaked Documents Reveal Counterterrorism Tactics Used at Standing Rock to "Defeat Pipeline Insurgencies"". The Intercept. Retrieved 2017-05-30.